CarniClear Liquid is a supersaturated liquid carnitine. It is ideal when economical high-dose carnitine supplementation is desired for supporting fat metabolism, energy levels and endurance. 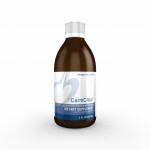 Vitamin B5 has been added to enhance the function of carnitine in fat metabolism. This product is an excellent choice for people who consume little or no meat and is best taken on an empty stomach.